Processional : (for the use of the Dominican sisters of St. Louis, Poissy). First and last leaves blank, very fine light quality vellum, complete; text 100 x 59-62 mm, ruled in red, 21 lines per page (text) or 7 red 4-line staves with square musical notation and textlines, staves superimposed on the original ruling (so they can appear double-lined) by one hand in a clean and regular Textualis Formata. 10 small miniatures and 3 historiated initials, 8 within full decorative borders, many pages with single-sided bars, some with further decoration of tendrils and ivy-leaves, sometimes inhabited by a bird or insect, countless illuminated initials in red and blue varying in size between 1-6 lines on square burnished golden grounds including tendrils and white penwork, some linefillers, rubrics and cadels; couple of minor tears to margins, one repaired with contemporary stitches, the pigments and gold particularly striking, a very clean fresh copy. ‘Pitou’ chased into the armorial gold leaf on vol 124v. ILLUMINATION: The subjects of the elegant panel miniatures and historiated initials are as follows: Mass of St Gregory fol.1; Presentation in the Temple fol. 13; Resurrection fol. 97; Ascension of Christ fol. 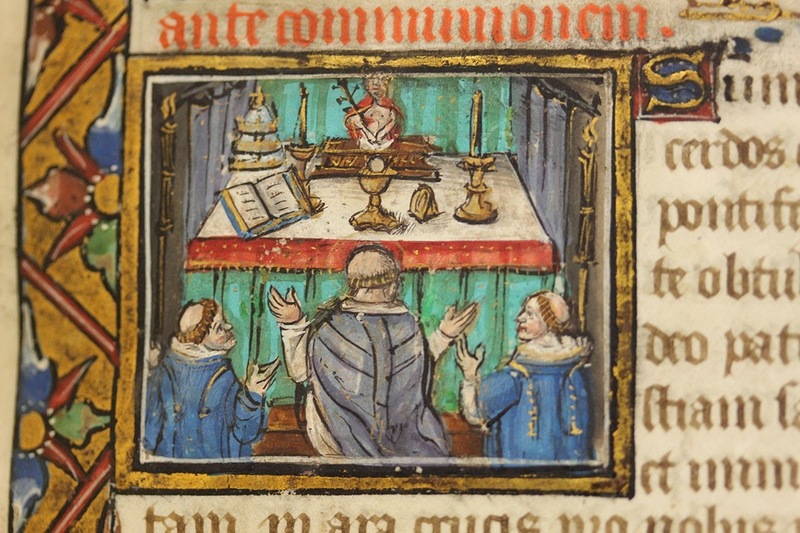 99; Corpus Christi with St Dominic and a Bishop fol. 102v; St Dominic with a dog (as a visual pun alluding to the “Domini Canes”, the dogs of the Lord, as the Dominicans became known after they had become active in the inquisition) fol.109v; Assumption of the Virgin fol.112v; St Louis fol.117; Nativity of the Virgin fol. 121; St Ursula fol. 124v; St Nicholas fol. 126; St Catharine fol. 131; St Sebastian fol. 141. St Catharine, St Nicholas and St Sebastian are historiated initials. The approximately square miniatures vary in size from 6 lines in height in the musical sections to 4 lines in the text. The Mass of St Gregory spans 7 lines. The style of illumination with very small-scaled miniatures implies that the manuscript must have been produced in Paris after 1510. The iconography of all 13 scenes is typical for early 16th-century Parisian illumination of liturgical manuscripts and prayer books. The technique and palette call to mind the works of the more famous and prolific Masters of Jacques de Besançon and the Master of the Chronique Scandaleuze. The small miniatures are dynamically rendered and show an artist, who routinely and skilfully mastered the challenge of depicting figurated and traditional scenes in convincing landscapes and interiors with very little space on the page. The vibrant palette and attention to interior detail reflect a distillation of the prevailing trends in Parisian manuscript illumination in the first half of the 16th century. Huglo’s suggestion that the sisters may have had a hand in illuminating their own manuscripts seems less likely here, given the quality of the miniatures (see M. Huglo, ‘Les processionaux de Poissy’ pp.339-346 in Rituels: mélanges offert à Pierre Marie Gy, P. de Clerck and E. Palazzo eds, 1990). The very special border decoration of bars and tendrils recalls earlier decorative styles of the 15th and sometimes even 14th centuries. 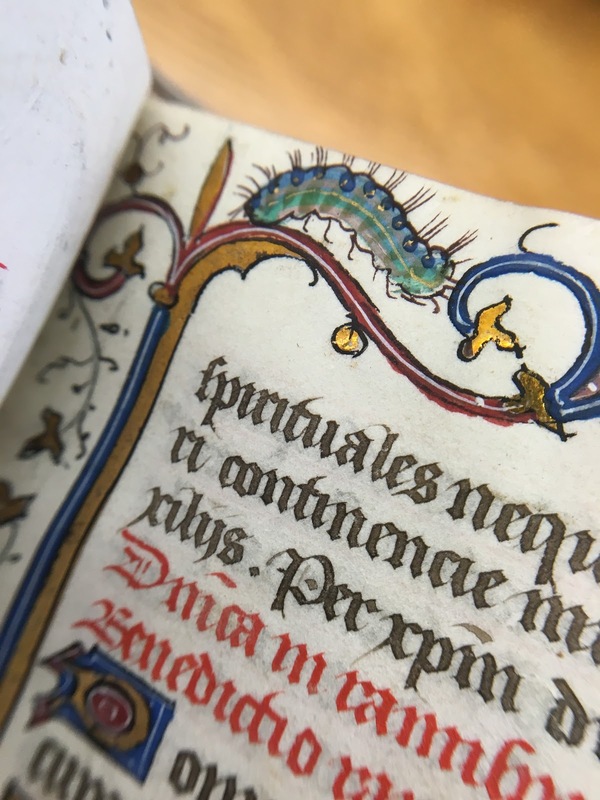 However, this archaising style in an otherwise convincingly 16th-century manuscript is a typical feature of the Poissy processionals produced in the last period that Naughton distinguished. Although none of the processionals that Naughton presents are identical in style of illumination, they sometimes share the same iconography, as most display the same style of archaising border decoration with its typical circular blue and red tendrils with single golden ivy-leaf or delicate three-sided burnished golden bars, as we would expect them in early 15th-century books of hours from the same region. 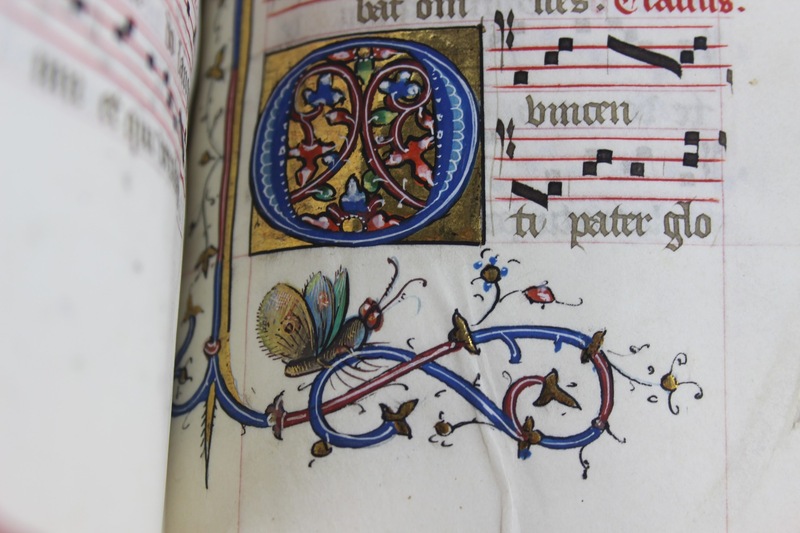 This is apparent in the repetitive patterns of the full borders – such as the fleur de lis motif used for the feast of St Louis, fol.117 – and in the vine tendrils with charmingly rendered birds and beasts elsewhere. 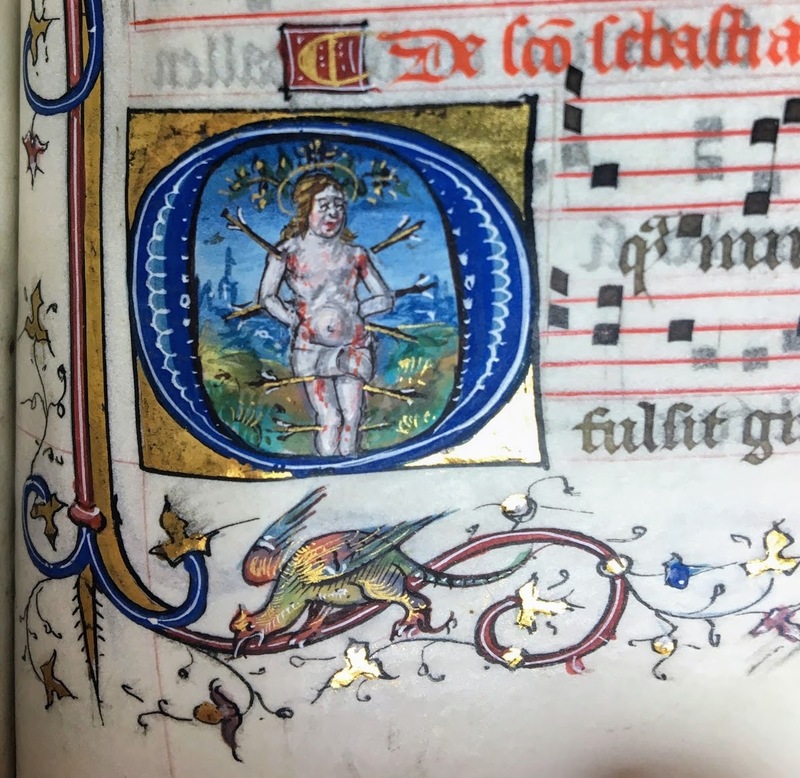 This same style and formatting of borders and miniatures can be seen in another 16th-century processional held at the Free Library of Philadelphia (MS Lewis E7; reproduced in: Naughton 1995, fig. 100, 105, 121, 122). 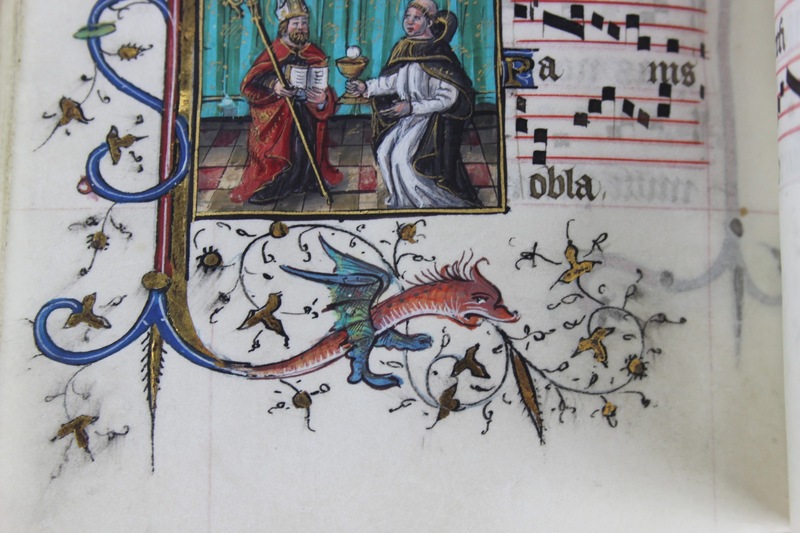 Another similar one is Archives du Diocèse de Chartres, ms 6 (reproduced in Naughton 1995, fig. 107, 120). The manuscript in Philadelphia does in fact contain a depiction of St Louis that is very similar to the one in this manuscript (fol. 117) (cf. Naughton 1995, fig. 122, of fol. 112). This processional was made for a sister of the Dominican Convent of St Louis in Poissy. One of the rubrics (fol. 38) of the processional text including the cleansing of the altars at Poissy on Maundy Thursday states: "Fferia quinta in cena domini ordo altarum abluendorum in ecclesia beati ludovici de pissiaco." The text opens with prayers to be said before and after communion and the blessing of candles for the Purification of the Virgin at Candlemass and ends with services for the infirm and upon the death of a sister. The major part of text and liturgy are devoted to the services around Eastertide. The Dominican Convent at Poissy was founded by Philip the Fair in honour of the canonisation of his grandfather St Louis in 1304, and was dissolved in 1792. It was a well endowed royal foundation intended for women from the nobility. 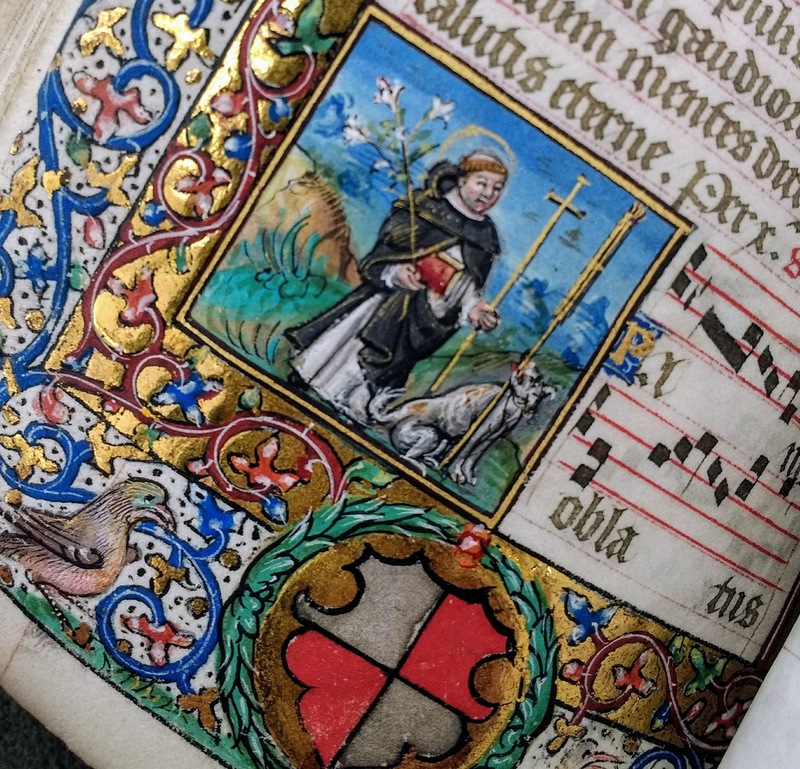 Joan Margaret Naughton discovered in 1995 that illuminated manuscripts for the lavish library of this convent were made during three well-defined periods of production, up to 1300, c. 1335-1345 and c. 1500-1535. 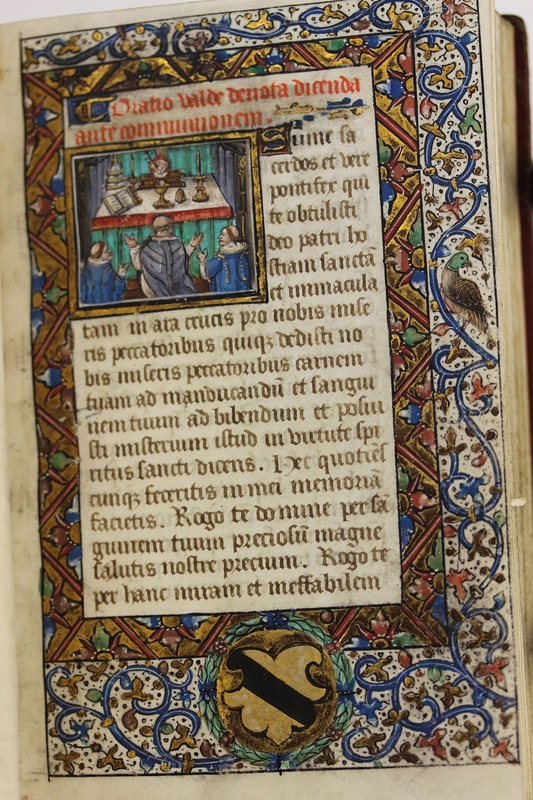 She claims that throughout, the nuns’ books were illuminated in the same area of Paris, in the flourishing centre of religious book production near the Dominican convent of Saint-Jacques. So far, 31 processionals have been identified to have come from this convent, and often, they were customised for each nun with her own arms. In fact, there are two different coats of arms to be found here: a) Or a bend sable (fols. 1, 124v), b) Quartered argent and gules (fols. 109v, 117). PROVENANCE: (1) Likely made for a sister in the Dominican house at Poissy, founded in 1298 by Philip the Fair and built by 1330: two coats of arms; one quartered argent and gules, and one or with bend sable – each appearing twice in the volume (ff.1, 109v, 117, 124v). After the nuns were expelled in 1793 during the Revolution, the books of the convent were scattered – each nun likely taking her own book. (2) ?In the collection of Parisian bookseller Jacques Techener (1802-1870), or his son, Leon. (3) Allan Heywood Bright: ownership inscription, 1896. (4) Auctioned at Christie's 16 July 2014. (5) Purchased from Sokol Books, March 2016. 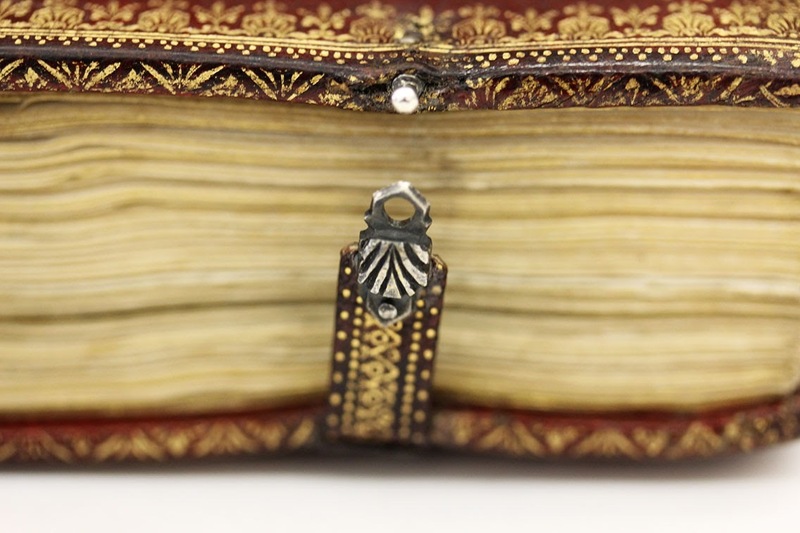 BINDING: In 17th-century gold-tooled red morocco by Le Gascon, complete with clasps. Scallop shell border, inner lace work panel, pointillé, corner and centre compartments with fleurons, dots and curls, very finely executed and perfectly preserved. 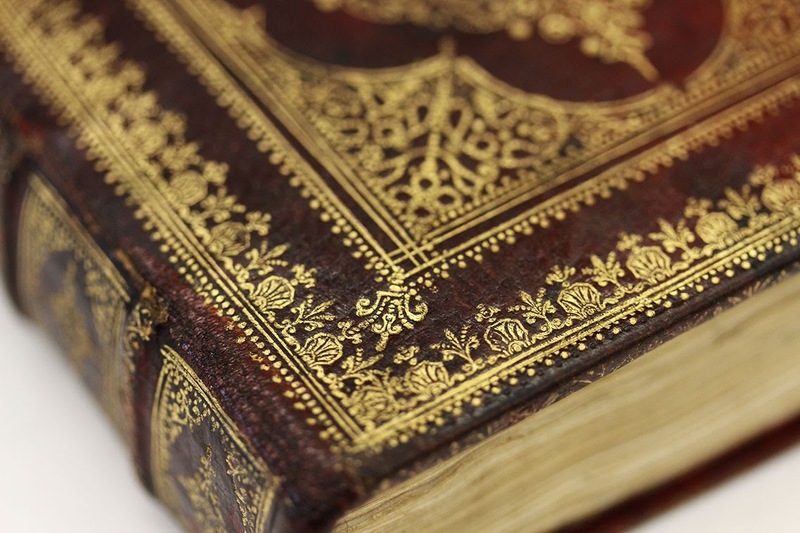 The binding is a beautiful example of the Parisian bookbinder Le Gascon’s later work. 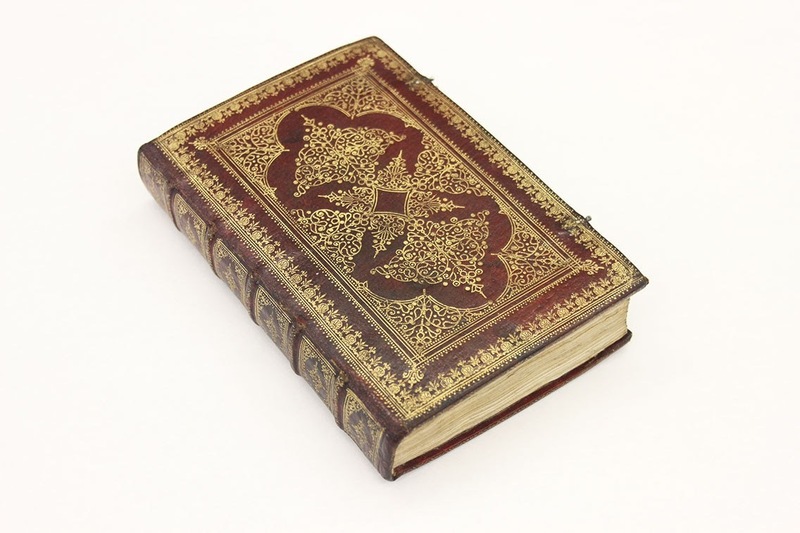 Active between 1620 and 1653, he used red morocco almost exclusively for his bindings and had all his ornamental tools for the gilding cut in dotted instead of solid outline. He worked for Gaston, Duc d’Orleans, Pierre and Jacques Dupay (perhaps the greatest French collectors of their day) and most probably, the Royal Library of France. Le Gascon, active 17th century, binder.